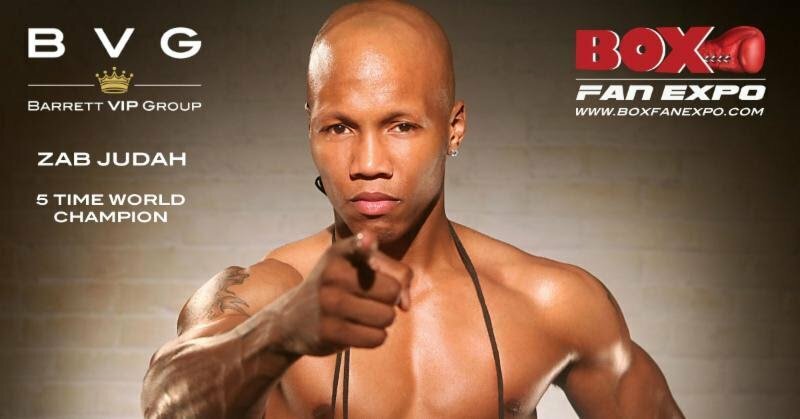 Five-Time World Champion Zab Judah has confirmed that he will appear at the “Barrett VIP Group” booth and hold a Meet & Greet with his fans at the Las Vegas Convention Center for the 4th edition of Box Fan Expo that will take place Saturday May 5, 2018 from 10am to 5pm, during Cinco De Mayo fight weekend. Judah will once again appear at this year’s Expo, where he will be will be signing gloves, photos and have merchandise for fans to enjoy. Boxing fans will also have a great opportunity to take pictures with this boxing star also known as “Super”. Judah is an American professional boxer and future hall of famer in the sport of boxing. He is a Five-Time former world champion in two weight classes, having held the IBF and WBO junior welterweight titles between 2000 and 2004; the IBF junior welterweight title again in 2011 and the undisputed welterweight title in 2005, which included a reign as the lineal champion from 2005 to 2006. Barrett VIP Group also known as BVG was co-founded in 2018 by former world heavyweight champion Monte Barrett. BVG is a unique concierge services that specializes in providing fight night experiences, catered to the needs of their clients that are looking to get close to the action and get the ultimate adventure with customized or pre-selected sports packages. BVG has close relationships with prominent fighters from past and present, which allows to provide their clients the best possible treatment, in an up close, personal and action-packed setting. BVG is based in Manhattan, New York. For more info go to http://BarrettVipGroup.com. Judah joins, Shannon Briggs, Badou Jack, Kelly Pavlik, Erik Morales and Fernando Vargas among early commitments to this year’s Box Fan Expo.